Run, Don’t Walk… to Get This CD!! Maria Schneider is at it again!! Her new CD,“Winter Morning Walks,” is simply sensational!! I let out an incredulous gasp after hearing this music. I can’t believe how gorgeous it is. Oh, but I really can. Why? It’s Maria!! She and the extraordinary soprano, Dawn Upshaw, had me welling up with tears in the parking lot of a grocery store, where I listened to this unprecedented CD for the first time in my car. 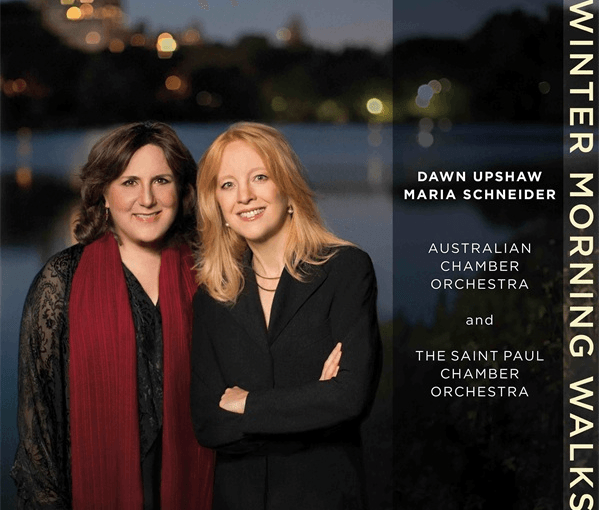 Run, don’t walk!… to buy this important, beautifully packaged piece of art, featuring Ms. Upshaw with The Australian Chamber Orchestra, The Saint Paul Chamber Orchestra, and Maria’s compositions written to poems by Ted Kooser, and Carlos Drummond De Andrade. To my knowledge, no one as ever tackled such an enormous feat of bringing together poetry, with two world-class Chamber Orchestras, and a virtuoso soprano. An amalgam of “must hear” music– this new album will have you memorizing musical lines, dancing in your seat, and feeling deep emotion at your core. I know this is a hackneyed phrase, but Maria paints an emotional landscape with her scores, and lifts you into the music, sometimes gently, and sometimes with a wind gust that’ll knock you into Tuesday! You’ll see what I mean when you hear songs that sing about everything that reminds you about life in the plains, to songs that reverberate with charm and sweetness, but with a twist of psychological thrill. Dawn has a gloriously rich and buttery tone — not overdone with operatic flourish, but beautifully endearing, where your ear hears expression, not high notes, or trilly vibrato. Maria never chooses the easy way out. Though considered a jazz composer, Maria departed from her band for this project, except for bringing along three of her regulars– geniuses in their own right — Scott Robinson, Frank Kimbrough, and Jay Anderson, to write new music for these chamber orchestras — a challenging task that she embraced with laser vision, and executed with the utmost professionalism. She’s not jazz fusion, and you cannot coin a term for her with this, other than genius at large! It’s just her blend of thought, timbre, passion, color and off-the-charts technique! Listen on track #9, “How Important It Must Be,” at 3:04, and you will hear a chord that will have the hair standing up on your arms.That’s just one example of how this music carves a deep impression into your soul. Adams Company Dance was blessed to choreograph three works to Maria Schneider’s music from her previous albums. It’s sometimes the space between the notes that bring me to a vision for movement. In Winter Morning Walks, I am taken not only into the space between the notes, but the space of imagination with the words, the strings, the plucking of the wires of the grand piano, the swelling, the crescendos and the quiet harmonies of chords, so beautifully crafted together, it’ll remind you of a baby being put to sleep in a crib. It’s unquantifiable how good this is, and I assure you, it will leave an indelible mark on your heart! It takes my breath away! I can’t wait to get into the studio with this new CD — of course, I’ll be running to get there, not walking! Thank you for creating this great masterpiece, Maria! Hollywood glamour meets modern dance, meets short-film… was this what I intended? Well, it was what happened last weekend. Put together one fine dancer, a talented filmmaker, and a choreographer– add to it a bunch of fancy dresses, props, a dance studio, and Guilford, CT’s most beautiful outdoor settings— blend it all together on high, and out comes what will be our next short dance film. Annie Church could’ve been Gloria Swanson’s stunt double in Sunset Boulevard, if she were alive then. Behind the lens, Amelia Golden captured the essence of the day with perfect timing, grace and artistry. The shoot in Guilford at the New Haven Ballet Studio, had us in rare form. I joked with Annie throughout the day, “Mr. De Mille, I’m ready for my close-up,” as images of cameo appearances from the Golden Hollywood era, danced into my mind. With bits and pieces of a theme in tow, but nothing really set, we got down, dirty, and even messy with mud, in our attempts to capture ideas about: all dressed up with nowhere to go. The idea stemmed from conversations with artists who struggle with their art. So many polished, poised, and prepared to take the next step, only to find… there’s no next step. Underneath it all, we are bare naked, with nothing other than ourselves. We watch as our dreams float away, and then somehow find resolve in the beauty of nature… nothing to expect other than the rippling, calm of a water in the estuary of life! Coming soon to a theater near YouTube! !